Want to Increase Margins and Cut Costs? Of Course You Do! Download our new eBook to learn how a Courseware Management Program can drive more training revenue & cut costs. Experienced Educations Services teams know that print & fulfillment of training manuals can be one of your largest expenses. A comprehensive Courseware Management Program can help you gain control over those costs.But how do you know that a comprehensive Courseware Management Program is right for you? Learn how other education services teams are cutting costs, providing better customer service, and driving more revenue with courseware management. 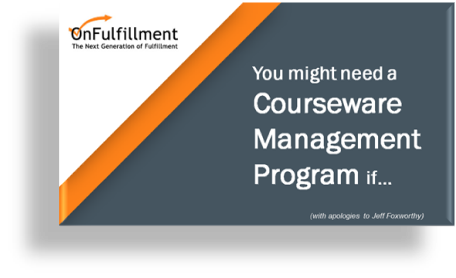 Complete the form to receive your free copy of the eBook "You Might Need a Courseware Management Program If..."